Can I have of list of Primary Services Offered By V-S? We are dedicated at providing all sorts of internet marketing services, namely SEO, Content Writing, Link Building or baiting, Link Pyramids, Backlink creation, Web Analytics, Data Entry, Email Marketing, Link Wheel Creation, etc. We have experienced staff capable to handling any sort of repetitive work. So, feel free to contact us even if the work you want us to do is not in the list given above. If I like Your Prices & Services. How Can We Get Started? You just have to fill our simple contact form along with some additional query not covered in FAQs and your query will be registered with us. We will revert back to you within a days time. Can I have a trial, so as to test the employee? Yes, we can arrange a 2-days paid trial, with no prior contracts. If you are not satisfied with the chosen employee, you can just pay for those 2 days and look at other alternatives. Yes, once you have chosen the employee after a 2-day paid trial, you will have to continue with our service for atleast 1 month. On completion of one month you can withdraw from our service, with just 2 days of prior notice. Can I Ask the Virtual Assistant to Handle Multiple Tasks? Yes, offcourse you can. We respect the fact that you are paying for the agent and his/her time, so you have all the right to ask him to manage any number of tasks possible in the working hours. How are the Virtual Assistants trained? If you want, you can forward your training material to us, so that the virtual assistant can go through it and work accordingly. Even if you do not have any training material, you can discuss things with our executive and avail their expert advice on how you can ask your Virtual Assistant to manage and finish your assigned work with efficiency. Our team will be very cooperative and will help you reap the maximum efficiency out of your virtual assistant. What will be the daily working hours of the staff? A full-time V-A will work for average 8 hours a day, with one lunch break. The schedule is continued for 5.5 days, which makes it a total of 44 hours a week. If I Face Some Problems With the Work of the Employee. How Much Time Will It Take to Resolve It? If you face any problem with the staff or his work or any behavioral issues, you just have to send an email with the subject ‘URGENT’, our team will be there to help you with the issue asap (maximum 12 hours). Will the Staff Work From Home Or In Office? We have all our employees working from our office situated in the Capital, i.e. New Delhi. The office is situated in a corporate house equipped with all the required facilities like power backup, technical support, managing team, etc. The reports are delivered either through email or through any other more convenient means of your choice. The frequency of reports enterily depends on the request of the person availing the service. Are There Any Payment Terms To Be Mentioned? We request payments in advance as we have to maintain a huge staff. We will begin with your work as soon as you have made a payment to us. We can consider payment options most convinient to you. Do We Sign Some NDA’s and Aggrement? Once we have finalised the deal, we will sign proper legal agreement and Non Disclosure Agreement, so as to maintain a fair work relation. Will My Virtual Assistant Use My Brand Name or Yours? 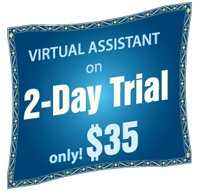 You are paying for availing this service, all the work your Virtual Assistant do is for you and is done under your brand name only. He works similarly as your personally hired employee will work. Do you work for Adult Sites? Yes, we can handle all sort of legal adult site promotions except e-whoring or websites illegal according to international laws.